TCI’s native plants are a long way from home. It is a plant fanatic’s dream—away from the exhibition greenhouses and behind the public barriers, the walk through the glass-walled corridor of the Tropical Plant Nursery at the Royal Botanic Gardens, Kew in London passes by huge glasshouse rooms keyed to the climate of the thousands of plants they hold. Several rooms each of orchids and ferns, a gigantic collection of Aroids, succulents and cacti, aquatic plants, and countless conservation projects are tidy but full. An assortment of plants grown in RBG Kew’s Tropical Nursery come from TCI seed. Far more densely packed than exhibition gardens can be, this area is Kew Gardens’ filing cabinet, an off-season warehouse, a horticultural hoard. Tropical plants from the farthest reaches of the world are held here. Some represent nearly the entire population of their species—indeed, some plants have been saved from wild extinction by their presence here. All of them are here for conservation, research, or display in RBG Kew’s open-to-the-public glasshouses, like the incomparable Princess of Wales Conservatory (P.O.W. ), the antique Palm House, or the majestic Temperate Glasshouse. But here in the humble, flat Tropical Nursery, plants don’t sit in the spotlight of the public displays with large-print nameplates and ample elbow room. Here they lurk in mobs, their embossed-metal ID tags partially obscured by the foliage of themselves and their neighbours, each hiding their name as would any stranger in a crowd. It takes time to introduce oneself to the collection, individually. Some announce who they are to botanists by means of character traits or reputation. A gigantic, blood-red spathe flower without any leaves wafts out a putrid stench—Ugh, that has to be an Amorphophallus, the botanist thinks. Another odoriferous one with spidery tentacles, growing from what looks like a sprouted onion stuck to a piece of bark, makes its greeter recoil, the botanical brain scolding curiosity: You know Bulbophyllum orchids can smell like death in a sewer . . . why would you sniff it? There are famous plants here: Giant Victoria amazonica water lilies in plunge-pool vats, huge titan arums with their single, purple-spotted umbrella-like leaf spreading a metre wide, and Darwin’s orchid (the one with the exceptionally long nectar tube which made Darwin correctly surmise the later discovery of a preposterously long-tongued moth that pollinated it). The celebrity plants are here, often out of hair and makeup, in between public appearances, resting and recuperating for the next big bloom event. Other plants are not so celebrated. The anonymous masses reach upward toward London’s less-than-tropical light in a tangle of photosynthetic optimism, a jungle-crowd organised on shelves and stands by family, genus, and species, filed in rooms by ecosystem of origin, awaiting the dedicated care of the horticulturists who look after them. In one of these rooms, on a less-than-assuming bench, grouped among other Caribbean plants, sits the Turks & Caicos Islands collection. Several species, grown from seed tested for germination by Kew’s Millennium Seed Bank, sit neatly spaced awaiting hopeful inclusion in the limited space of the public glasshouses. Not all will achieve this stardom—the competition is fierce—but to their keepers, they are every bit as dear even behind the scenes. Their siblings, which are still seeds, are now stored for long-term conservation in the Millennium Seed Bank’s deep underground freezers, lying in wait to be used to save the species should some catastrophe befall wild populations. 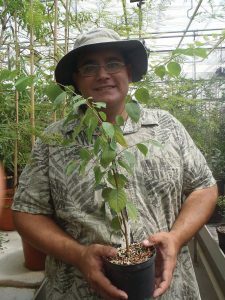 The author with TCI’s popular medicinal tree “mauby”. But they have other siblings as well. Seeds from most conservation collections made in TCI are split before they are shipped to the United Kingdom, and a small share goes to the Native Plant Conservation Nursery at the Government Agricultural Station in Kew, North Caicos. There, they live in a ramshackle, breezy shade-house rather than a coddling glasshouse. They are protected from too much sun by shade-cloth, rather than being exposed to the transparent glass roof of the Tropical Nursery. They tend to grow a little more tough and compact, while their London brethren relax into a looser, tenderer growth habit. Just like anyone who leaves their original home to expand their experiences abroad, these plants change and develop new potential when grown in the Tropical Nursery. One, a spindly winder called snapdragon vine Maurandya antirhinniflora I remember from my youth on the roadsides of Cork Tree in Grand Turk, creeps thinly through thorny Acacia trees, flowering sparingly. Its baby blue flowers, looking like frilly little cornucopias, and sharply triangular leaves make it look like it would be a real winner in the garden if only it grew with a little more gusto. Seeing it growing in the Tropical Nursery verified that—even when bound in tiny pots, the lush foliage and abundant flowers, vines mounded upon themselves, made me ask why the plant wasn’t already on public display. “This looks a lot better than that junky plastic-looking Hoya they’ve got festooning every ledge in the P.O.W.,” I said to my colleague there, with an upturned palm and a single raised eyebrow. In the relatively cool, humid, dim conditions of the Tropical Nursery (compared to the full sun, salty drought, and dusty tradewinds of Grand Turk) the plant can afford to relax and put on a little more body. Similarly, I recall when the San Diego Zoo’s horticulture team grew out seeds found in wild Turks & Caicos rock iguana droppings for identification for a diet study, and some of the mystery seeds from Big Ambergris Cay turned out to be the National Flower, Turks & Caicos heather Limonium bahamense. But after six months of growing in the upper 70s, humid, sunny world of southern California’s Mediterranean climate the heather, normally a stiff, tough, upright scrub-brush of a plant just a hand-length high, had changed. It had grown so leggy and lax that it had to be planted in a hanging basket; its succulent stems dangled scandently, heavy under their own weight and turning up at the tips just enough to show some I-just-woke-up flowers, spread out along the stem. It didn’t look like a plant that had given up, it just looked like a plant so spoiled rotten from its origin in the hypersaline salt marshes of the Turks Islands that had become as cheerily apathetic as a garden petunia. My colleague and I discussed the need for an intervention, and the horticulturists asked for help in understanding the plants’ natural habitat. While the RBG Kew horticulturists do go into the field on occasion, they don’t go everywhere their charges naturally grow, and so can’t be familiar with the exact wild conditions of every single one of their thousands of plants. We put together photos of the wild habitats of the four species they were growing—the dry, rocky shrubland of the tall orchid Encyclia altissima; the ridge-top limestone outcropping windswept locale of the rufous orchid Encyclia rufa; the salty leeward coastal coppice of the Inagua orchid Encyclia inaguensis, and the sand-blasted low windward dune scrub of the endemic Caicos orchid Encyclia caicensis. 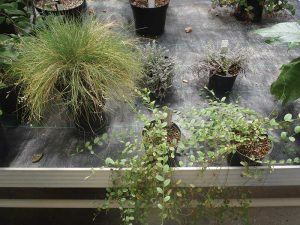 The decision was taken to move the plantlets into a different room for awhile, giving them brighter light, warmer temperatures, more air movement, and far less humidity and water. The mature orchids may well be rotated into the Princess of Wales Conservatory’s dry tropics orchid room when they bloom, as is the routine. Blooming potted orchids are shifted into glass display cases in the orchid rooms, then traded back to the Tropical Nursery for replacements when their blooms acquiesce. They will get their chance at a spot in stardom for their blooming weeks. Other plants from Turks & Caicos are waiting in line for the completion of the Temperate House refurbishment. Lots of specimens throughout the Tropical Nursery are up for this audition. Space is limited; selection will be cut-throat. Only the best-looking, most botanically representative plants will be selected. Our colleagues in the United Kingdom Overseas Territories Programme at RBG Kew are working hard to nudge our plants, as well as those from other UKOTs, to the front of the display. Exhibiting the plants brings awareness to the conservation issues in the Territories, and to the Territories themselves, in an outside world where we are largely forgotten. I anxiously await the day I can tell homesick Turks & Caicos Islander students in London universities that they can visit a touch of home in the glasshouses at Kew Gardens. Until then our plants, botanical ambassadors to the political centre of the Kingdom, lurk in the masses, unaware of the dry, salty, bright conditions from whence they came. Plant communication is a new and hotly debated topic of study, but I wonder what each species would write home to their families about their new lives abroad.